Four artists are coming together for a large pop-up show that includes a variety of styles and media. Among these will be a mix of works in watercolors, oils and acrylics in large as well as small formats, from realism to contemporary/abstract. The location is being creatively transformed into a bright and airy three-level gallery space. The artists featured are Jeannie Busby, Kim Fairbanks, Sally Kondziolka, and Colleen Krushelinski. 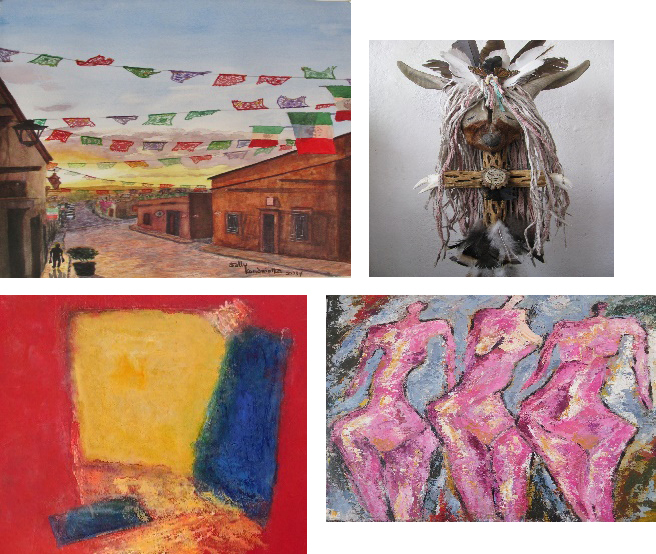 Jeannie Busby – a former resident of San Miguel de Allende – presently resides in Ajijic. Her fascination with the human figure is evident in her acrylic paintings on canvas where she captures the human form in experimental and dynamic ways. Jeannie’s works are neither realistic nor abstract but somewhere in-between. This is artist Kim Fairbanks’ first exhibition in what she entitles “The Mop Series.” How this series came into being in Kim’s own words: I was driving to the dumpster to discard three used mops and I could not do it. They each had such unique character and form evident of a tough life and the character of the owner. Thus, I took them home and propped them on the wall for they spoke to me. Sally Kondziolka's watercolor paintings feature realistic scenes from San Miguel de Allende and around Mexico as well as images from many other countries and cultures around the globe. Her more recent works feature portraits as well as landscapes. Inspired by universal emotions, Sally strives to capture expressive moments across all cultures in her paintings. Some of her works are framed, some matted and some unframed. Colleen Krushelinski is constantly learning and experimenting with different media. She paints in a fun and whimsical style but is currently enjoying playing with the intricacies and nuances of color, shape and form in abstract ways. She also loves working with clay.